Over 28 per cent of people have fallen victim to a burglary, a new survey has found. 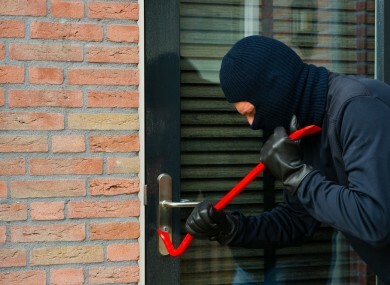 A SURVEY OF almost 15,500 people has revealed that nearly three in ten have been burgled. The survey, carried out by AA Ireland, showed that figures in the capital were much higher, with over 38 per cent falling victim to the crime at some stage. The Dublin commuter belt fared almost as badly, with Kildare coming in second with 34 per cent of respondents saying that they had been victims of a robbery from their home. There were also high numbers of people saying they had been burgled in Meath, Louth, Laois and Offaly. The latest CSO figures on burglary back these responses up, with incidents up 22 per cent in Western Dublin up by 22 per cent between 2004 and 2012. In Munster, 22 per cent of Limerick residents said they had fallen foul of burglars, but CSO figures show the crime falling in Cork. Leitrim leads the way in Connacht, with 21 per cent of having been burgled, while Cavan led the way in Ulster, with 19 per cent. Conor Faughnan director of consumer affairs at the AA says that the numbers are not surprising. Email “Dublin and commuter counties worst for burglaries - survey”. Feedback on “Dublin and commuter counties worst for burglaries - survey”.